Good morning and welcome to the Grow Your Blog Blog Hop! This blog hop is all about networking and building your blog. Each week from Thursday through Sunday I will host the Grow Your Blog link party, along with a few co-hosts, in order to promote blog networking. Why is blog networking great for you? Simply put, it increases readership and traffic to your blog. How do you network? Visit. Comment. Invite. Communicate. These are key to growing your blog. Visit and follow other bloggers. Grab a button and promote the party! The more participants, the more bloggers to network with! Contact me at thisgalcooks@gmail.com and I will schedule you! Hi! New GFC follower from the Grow Your Blog blog hop! I would love for you to swing by and follow me back if you get a chance! New follower from the hop! Thank you for co-hosting! Hi Carrie, I'm your new follower and you have a lovely blog. Looking forvard to reading your recipes. Hi Carrie. Glad I saw you tweet about this so I could come join you! Hi Carrie,I'm visiting from This Gal Cooks. That sloppy joe looks amazing by the way! I am following you via GFC and Twitter. I would love for you to visit and follow back! Hi! 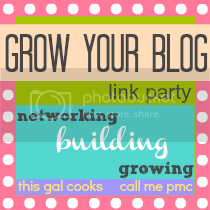 I'm a new follower on GFC through the Grow Your Blog Link Party! Thanks for hosting! I'm a new follower on Twitter and just joined the blog hop. Thanks so much for co-hosting. I love finding new recipes and food blogs. Im a new follower, following you on GFC, Twitter and Pinterest, thanks for co-hosting the blog hop! I loved your sloppy joe recipe!